Silky shown with optional 'Lil Tiger Tamer. Quarter shown for sizing purposes only. 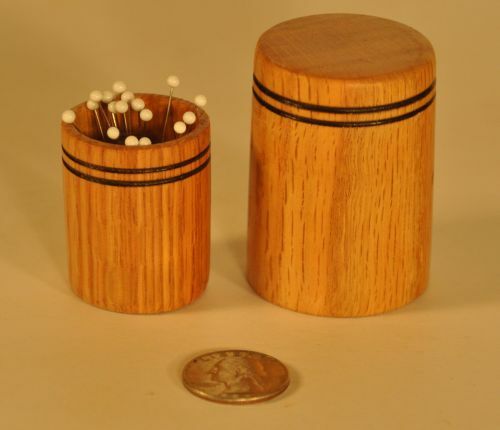 The Silky is a very small (approximately 1¼" wide by 1¾" high) pin holder that is used to hold the silk pins used by sewers with their domestic machines. As with the other pin holders I make, this one incorporates a magnet in its flat base. The main purpose of the magnet is to keep the pins in the holder, however it will also hold the Silky to a metal surface to keep it from moving. The 'Lil Tiger Tamer functions in the same manner as do the Kitty Kover and the Feline Fooler. Their purpose is to hide the pins from cats. The 'Lil Tiger Tamer also serves as a handy lid for the Silky for when you want to safely transport your pins to another location without them falling out of the Silky. Both the Silky and 'Lil Tiger Tamer now come in 5 different wood options. 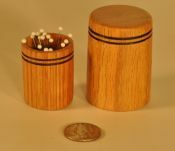 Shown above are Silky and 'Lil Tiger Tamer pairs of, from left to right, Red Oak, Pennsylvania Black Cherry, natural White Ash, dyed White Ash and Black Walnut.